It's likely Dene had been aware of oil seepages along the banks of the Mackenzie River for many generations. Even Alexander Mackenzie, in 1789, couldn’t fail to notice that “pieces of petroleum which bears a resemblance to yellow wax” could be seen at various locations along the river that would eventually carry his name. In 1911 J.K. Cornwall of the Northern Trading Company saw an oil slick on the surface of the Mackenzie River near Fort Norman (now Tulita) (map). He hired a local Dene trapper, Karkassee, to locate and take samples from the source of this slick, a small pool of oil on the riverbank downstream from Fort Norman. These samples were analyzed in Pittsburgh and found to be of high quality. In 1919 Imperial Oil purchased J.K. Cornwall’s claim and sent their geologist, Ted Link, north to investigate. He led a party of eight men, a drilling rig and an ox from Edmonton to the area where these pools of oil had been seen. The men survived the extreme cold working through that first winter, but the ox was served for Christmas dinner! The next summer, on August 27, 1920, the crew watched with delight as their drill struck oil creating a 70-foot gusher. The location became known as Norman Wells because of its proximity to Fort Norman (now Tulita). 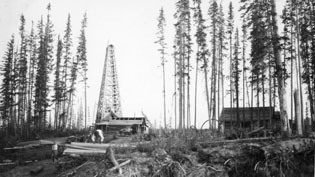 The Norman Wells area became the site of an intense but short-lived oil staking rush during the summer of 1921. Due to the difficulties with transporting oil south it was used primarily to supply the fuel needs of the North. It wasn’t until 1942, with the construction of the Canol pipeline, that some of this oil was pumped across the Mackenzie Mountains to the Yukon. In 1985 an 869 km pipeline stretching from Norman Wells to Zama in northwest Alberta was completed. It’s the first completely buried Canadian oil pipeline built across permafrost terrain.